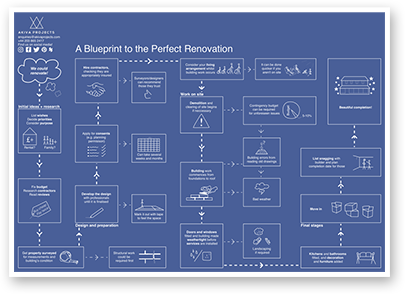 The key ingredient to any successful renovation project is organisation and the Akiva Tool kit was developed precisely to provide that to you. The 10 documents are so powerful to the first time renovator and consist of everything you need to manage your project with ease. They can be download separately or as the complete package and consist of a blue print to the achieving the perfect renovation and protecting you with the most important things that should be in any building contract. Since its launch back in 2017 it has been the preferred choice for thousands of our customers versus high costs in project management fees. You may have found just the right building company but feel you want to manage the project yourself, and these documents have been design purely to make the managing process more streamlined and organised! If you are looking to renovate, this tool kit is perfect for you because it saves you time! You don't have to write lists yourself and your building company will love you for being so organised! “I am an experience Builder. This Toolkit will help my customers think about the processes and decisions before the 11th hour. The Tool Kit is great template to work with, to make the project you are thinking about flow smoothly and stress free. It makes the process easy to follow for both Customer and Contractors alike. It helps make sure that all elements of the process are thought about and actioned in time for designs, materials and contractors to be in place. So that everything is working efficiently. “I found the build contract must have's document very useful and advised my builder to implement them in our contract before we start works. Q IS IT FREE TO DOWNLOAD? The initial download is, but this is just a tip of the iceberg in terms of value, the other documents empower you to manage your home renovation, and save you money. People that have bought the full toolkit have saved thousands of pounds during the project. Q WILL YOU BE ADDING TO THE AVAILABLE CONTENT? Q COULDN’T I JUST FIND THIS INFORMATION ON THE INTERNET? The internet is full of information and any dated information does not disappear. It could take you hours to find the right information whereas it take less than a minute to download the tool kit plus you will not find these professional documents anywhere else. Q HOW DO YOU CREATE THIS INFORMATION? Q HOW WILL THIS HELP ME IN MY RENOVATION? Q CAN I SPEAK TO SOMEONE ABOUT MY PROJECT CONCERNS? Absolutely, just fill out the contact form, one of our team will be in touch.